Don Jackson Chrysler Dodge Jeep RAM Fiat has the 2019 Dodge Journey you want in stock right now. We are a premier new Dodge dealer right here in Union City, GA. Our team wants to pair you with the best Journey model for your needs during your next visit. Continue reading to learn more about the 2019 Journey's trim levels and features. The 2019 Journey comes with two available power options to help you conquer your next adventure. Standard is a 173-horsepower 2.4-liter inline-four-cylinder engine channeling its front wheels through an automatic transmission. The Journey averages 25 miles per gallon on the highway as well, making it a great option as your daily driver. Also available is a 283-horsepower 3.6-liter six-cylinder engine cranking out 260 pound-feet of torque. Additionally, all-wheel drive is available with the six-cylinder engine option for conquering rocks, snow, rain, and mud. There is something for everyone in the new 2019 Journey. Standard features vary by model and include satellite radio, an infotainment system, second-row in-floor storage bins, Bluetooth, a six-speaker audio system, a leather-wrapped steering wheel, and push-button start. There are also optional features including leather-trimmed heated front seats, a universal garage door opener, a power sunroof, navigation, and a rear-seat entertainment system. This entry-level Journey model comes with more than enough features for you and all your passengers. There is seating for up to seven with ample space for cargo as well. Standard is a 173-horsepower 2.4-liter four-cylinder engine mated to a four-wheel automatic transmission. Front-wheel drive is also standard with a fuel economy of 25 miles per gallon on the highway. Features in this trim level include dual-zone climate control, a 4.3-inch touchscreen infotainment system, USB port, a leather-wrapped steering wheel, satellite radio, and 17-inch wheels. Also available is a six-speaker sound system, keyless entry, push-button start, voice commands, and an overhead console storage for added cargo room when needed. Up next is the new Journey SXT model. This trim level gets an upgraded 283-horsepower 3.6-liter six-cylinder engine producing 260 pound-feet of torque. This model also comes with available all-wheel drive for the backroads of Union City. The Journey SXT comes with all the features included in the Journey SE and so much more. Available innovations include a power-adjustable driver’s seat, a rearview camera, tri-zone climate control, a conversion mirror, rear parking sensors, and an upgraded 8.4-inch touchscreen Uconnect infotainment system. There is also the new Journey Crossroad model with features like heated front seats, a universal garage door opener, an upgraded audio system with a subwoofer, and 19-inch black alloy wheels. Also included is a sunroof, a rear-seat entertainment system, navigation, and leather seats. Lastly, the Journey GT rounds out the lineup coming with a heated steering wheels, heated front seats, a premium sound system, remote start, a security alarm, 19-inch alloy wheels, leather seats, and an available Trailer Tow Prep package towing up to 2,500 pounds. 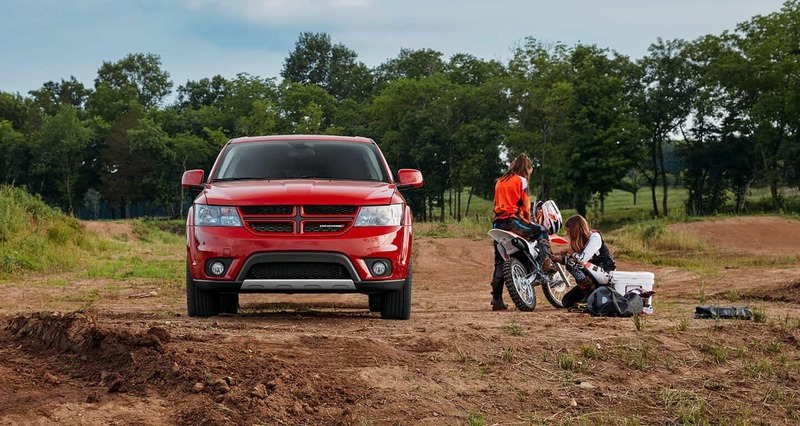 Once you've decided on the 2019 Dodge Journey model you want, get down to Don Jackson Chrysler Dodge Jeep RAM Fiat. We want to earn your business and look forward to pairing you with your new Journey today. We also want to help you get the auto loans and leasing options you need as well. Our finance center is here and committed to getting you an incredible offer while staying within your monthly budget. Start the pre-approval process from home by filling out an online finance application. Reach out to our sales team to schedule a test drive and ask about our exclusive financing offers as well.